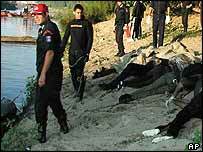 More than 20 illegal immigrants thought to be mostly from Pakistan have been found drowned on the Greek border. A search began after the first bodies were discovered on the banks of the river Evros on Tuesday. Up to 26 bodies - including two women - have been found so far, although the authorities are not yet certain if they died as a result of a vessel capsizing. Tens of thousands of illegal immigrants try to enter Greece every year. Correspondents say most fatal accidents involving migrants occur in the Aegean Sea, as migrants try to sail from Turkey to Greece. It is the first time so many have drowned trying to cross the Evros, according to Reuters news agency. "We have not found a boat, we have not found anything that could show how these Asians, most (of) whom are from Pakistan tried to cross over and explain how they died," a local police official told the agency. "They either drowned after their boat sank or something else happened on board and these people were thrown into the water," the official said. " Other police said the immigrants were estimated to be aged between 25 and 30 and that documents found on some of the bodies were from Pakistan.